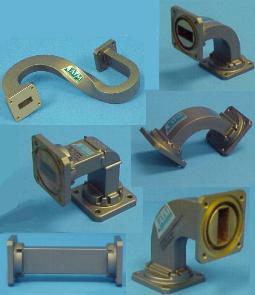 These are the waveguide assemblies and transitions that give Microwave Engineers the nickname “Plumbers”. They are the interconnecting tubes in many different sizes and materials. Waveguide assembly components are essential for connecting the various components together to create your waveguide RF system. 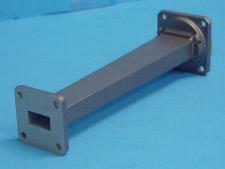 These waveguide components act like wires that connect all the Waveguide components together in any microwave system, from the Transmitter to the antenna. 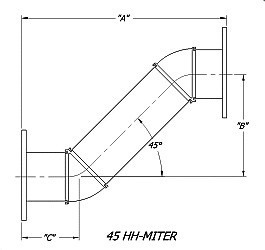 ATM manufacture assemblies in Waveguide sizes WR650, WR430, WR340, WR284, WR229, WR187, WR159, WR137, WR112, WR102, WR90, WR75, WR62, WR51, WR42, WR34, WR28, WR28 and WR22 covering Frequency Bands from 1.12-50.0GHz We also work in wide Band, Double Ridge Waveguide size from WRD200, WRD250, WRD350, WRD475, WRD580, WRD650, WRD750 and WRD180. Our products range from light weight thin wall space qualified flight waveguides assemblies using aluminum material, to very high power high pressure, high power assemblies used in medical research and Patient treatment equipment in OFHC (copper) material. Our waveguide assemble are manufactured using Dip or Torch Brazed, and, then tested 100% mechanically and electrically for all critical parameters. 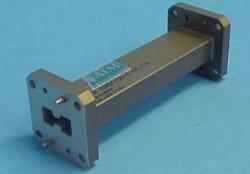 Check out our Waveguide Components Menu for a complete list of Waveguide components.